Add the room temperature milk and half and half, then stir to blend everything together, and bring to a quick boil. As soon as the soup starts to boil, immediately turn the heat back down to a simmer, and allow it to simmer for another ten minutes. Whisk in cheese, and check to be sure consistency is to your liking. Add more stock if it seems too thick. Strain entire contents into another large pot, and add salt and pepper to taste. 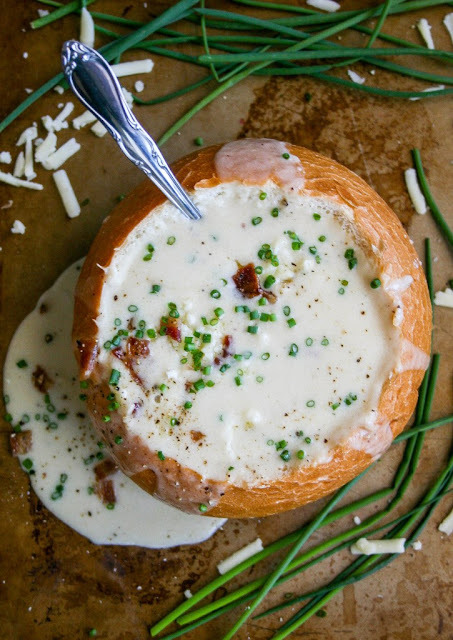 Serve in a bread bowls, garnish as you please, and enjoy! By sara rose : a flavor journal. 0 Response to "spicy white cheddar beer cheese soup"